Herman Miller produces some of the best office furniture designs in the industry. Their products are often seen as innovative and the company is recognised as market leaders. 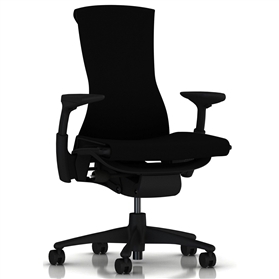 One of their most popular ergonomic task chairs is the Herman Miller Embody Rhythm. It is, in fact, one of the best task chairs ever created and it is hard to find something that will suit your needs better. The chair in universal and perfect for all kinds of office environments. It also wouldn’t look out of place in an executive office either. It is one of our most popular products. The Embody black office chair is amazingly comfortable and adaptive to all kinds of environments. It is also designed to adapt to your body movements to make sure that you have the right support while seated. It is important that you have an ergonomic task chair while working so that you have the right kind of support while seated. One of the major causes of back pain is related to sitting for long periods at a desk without the right kind of ergonomic support. The Herman Miller Embody offers the perfect balance of support and comfort to ensure you have the right kind of working conditions. It is finished in a breathable fabric and upholstered over an ingenious sprung seat. This means that not only does the chair offer the right level of comfort and support, the breathable fabric also keeps your body at the right temperature. It allows heat to escape so that you are not getting too hot and sweating at your desk. The Embody chair features a super smooth recline mechanism and also a thoracic adjusting back so that you can not only cradle your lumbar region but also the middle section of your spine. Movement is key to this chair and you can adjust the tilt limiter to recline to various angles. A seat depth adjustment is standard for taller people and so are the height and width adjustable arms. Herman Miller is one of the biggest brands for office furniture and provides high-quality office chairs for all kinds of environments. They even offer a 12-year manufacturer’s warranty on the Embody, so you can rest assured your chair will last. If you are looking for something else by Herman Miller then make sure you take a look at our complete range of products online.